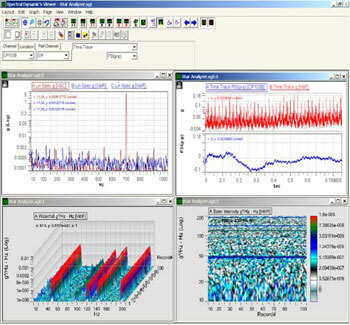 The Computer-Aided Test Suite™ Star Analyzer package is a standalone software package t hat offers unsurpassed analysis for variable speed measuring applications, along with general purpose signal analysis. It allows you to analyze time stream data files without any additional hardware other than a PC. These data files could come directly from the Puma or the Puma Export Manager can convert time-streamed data from other sources. When selecting bandwidths lower than the original data bandwidth, we will filter, decimate, window, and Gate the data as per your setup. You also have the ability to increase or decrease your resolution, store the reprocessed data, and still have all of our real time display capability. It is not necessary to replay the entire data file. You can start and stop at different points in the data file and play the data back at different rates. Star Analyzer is an extremely powerful post-processing package.